Montreal's Nadim Elgahry is a busy fellow. The Time Bum has already featured stories on his other two brands, Makara and Helgray, but he is also a partner in Rossling & Co., which produces slim dress watches. 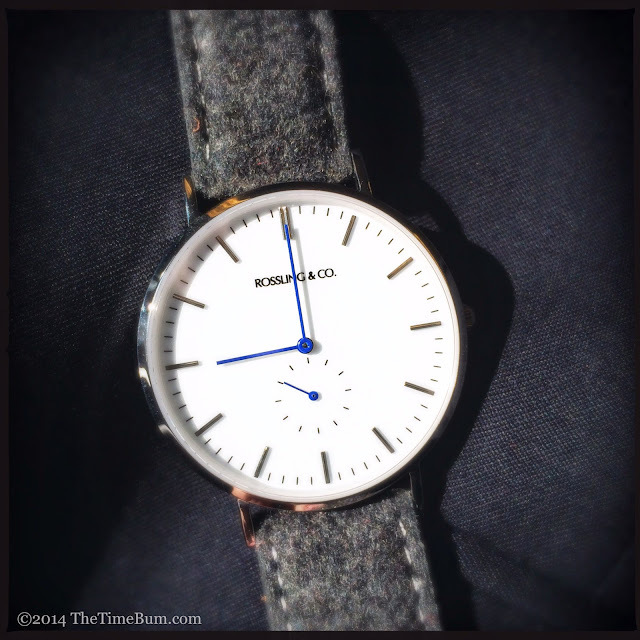 The first, a Swiss quartz with a minimalist dial and tweed strap, launched on Kickstarter just about one year ago. The crowd funding community liked what they saw and two days later, it was fully funded. 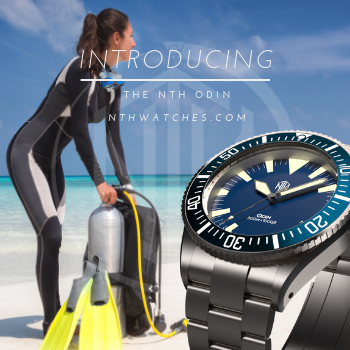 Since then, the initial batches have met their owners, the quartz model has been revised, and a new automatic will be launched on Kickstarter on Tuesday, October 7. 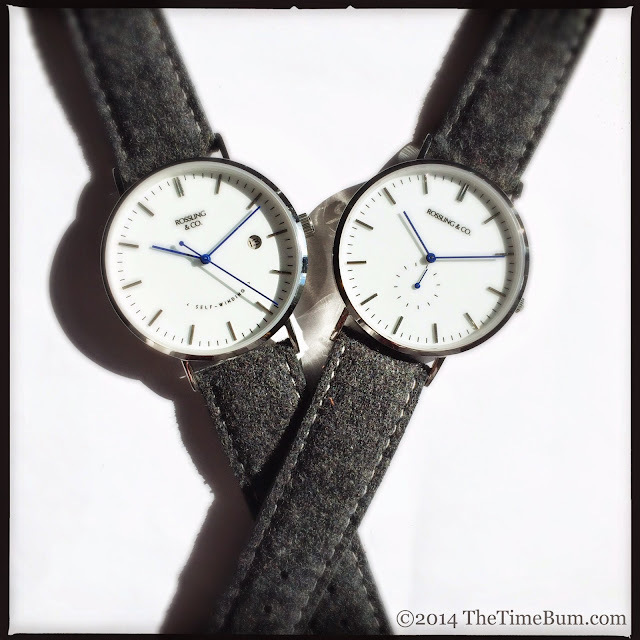 Rossling & Co. provided one of each for this review, both with white dials and blue hands. At first blush, the two are remarkably similar, but is is interesting to see how the two kinds of movements make two very different watches. Please note that the automatic sent for review was part of the initial batch, and this model may see improvements as Kickstarter stretch goals are attained. The quartz is in stock now for $179. The automatic will sell for $499, but will be available for pre-order on Kickstarter for $359 - $399. 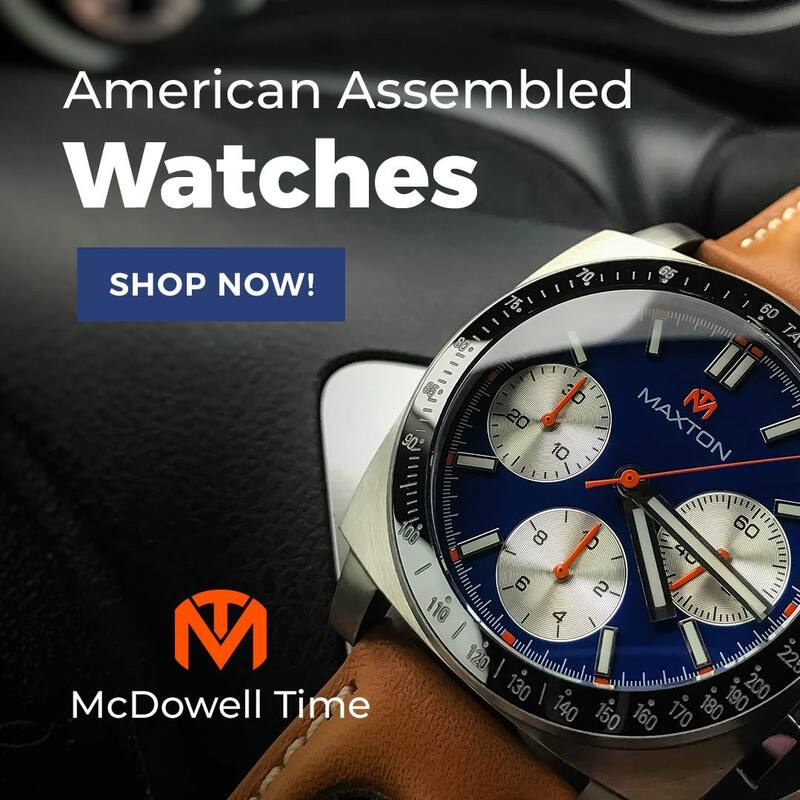 Both watches have polished stainless steel cases with flat sides, rounded case backs, straight lugs, and a flat sapphire crystal. They both have expansive dials that fill the entire surface area of the case save for a slim bezel. Typical of most dress watches, the have no luminous paint. Water resistance is only 3 ATM for the quartz, which is on par for a dress watch. The automatic is rated for a more robust 5 ATM. At 40mm across, they are an appropriate size for a modern dress watch, and perhaps even more importantly, they are a proper thickness. I have always been of the opinion that a thin, elegant watch is best with formal wear, and both of these watches fit the bill. The lugs on both watches are angled downwards. On the original quartz edition, they were fitted with a screw bar, the heads of which protruded from either side. The new cases have eliminated the screws in favor of a conventional spring bar and drilled lugs. I think this was a good choice as I am not a huge fan of fiddling with tiny screwdrivers, and the security of such a design is entirely unnecessary on a dress watch. Moreover, the new lug design is more in keeping with the clean lines of the case and the drilled lugs make strap swaps much easier. The case backs of both watches are solid and decorated with the Rossling & Co. brand. The heads of four retaining screws are also visible. The quartz model uses a Ronda Slimtech 1069 quartz movement with a 3-year battery life. Rossling & Co. took full advantage of its diminutive size, housing it in a positively wafer-thin 7mm case. The undecorated crown is a tiny polished nub, not unlike that on the Helgray models. It makes sense given the low profile of the case, but looks undersized when viewed from above. The automatic model has a Miyota 9015 inside. This is the familiar high-beat movement used by many micro brands of late. It has 24 jewels, a smooth 28.8k bph beat rate, 49 hour power reserve, and hacking and hand winding capabilities. Typical of these Miyotas, it also has a noisy rotor. 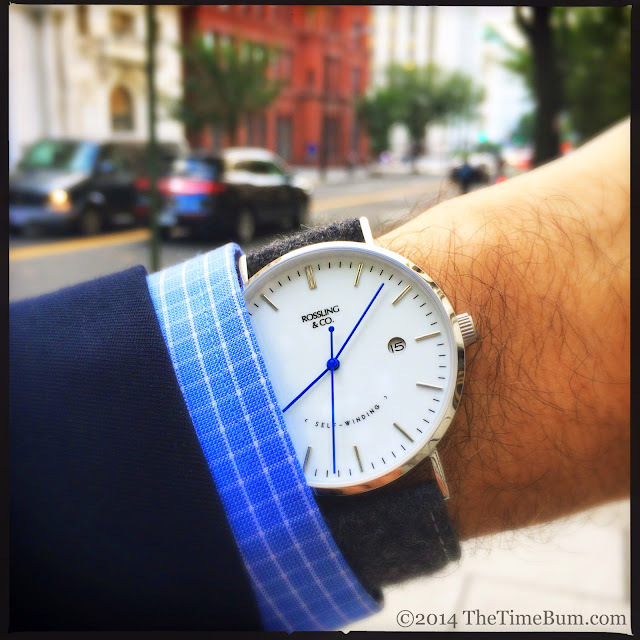 I have grown accustomed to this in tool watches, but I find it distracting and out of character in a dress watch. The unit is larger than the Ronda quartz, but still fits a case that is only about 9mm thick. This is bigger than the quartz, but still quite svelte. The crown is larger and more substantial than that of the quartz. It is also signed with a Rossling "R." Personally, I find the case to crown proportions to be better on the auto than the quartz. Dial designs are clean, modern, and balanced. Both have stick shaped markers and hands. The markers are applied and polished, the hands are blued. It is a particularly pleasing combination against the milky white dial, at once contemporary and traditional. This is the only color combination available on the automatic. Quartz buyers may opt for black/silver and white/silver versions. The quartz has a small seconds counter that fills out the lower half of the dial, and balances nicely against the black Rossling & Co. brand at the top. The size of the dial allows the sub dial to be positioned near the center so it does not interfere with the hour markers. There is no other text on the dial. It is clean, simple, and restrained. In contrast to the quartz, the automatic has no small seconds, but rather a blue central second hand with a small, round counterweight. 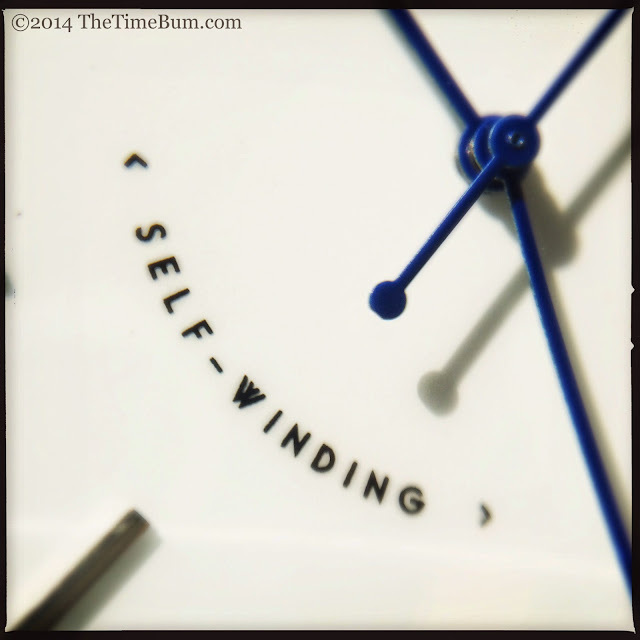 The space at the lower half of the dial is filled with the text "Self Winding" in an arc flanked by arrows. I like the way it balances the branding at the top (this time with the words stacked) and mimics a rotor engraving, creating a gentle reminder of the automatic movement within. It also features a porthole date window at 3:00. 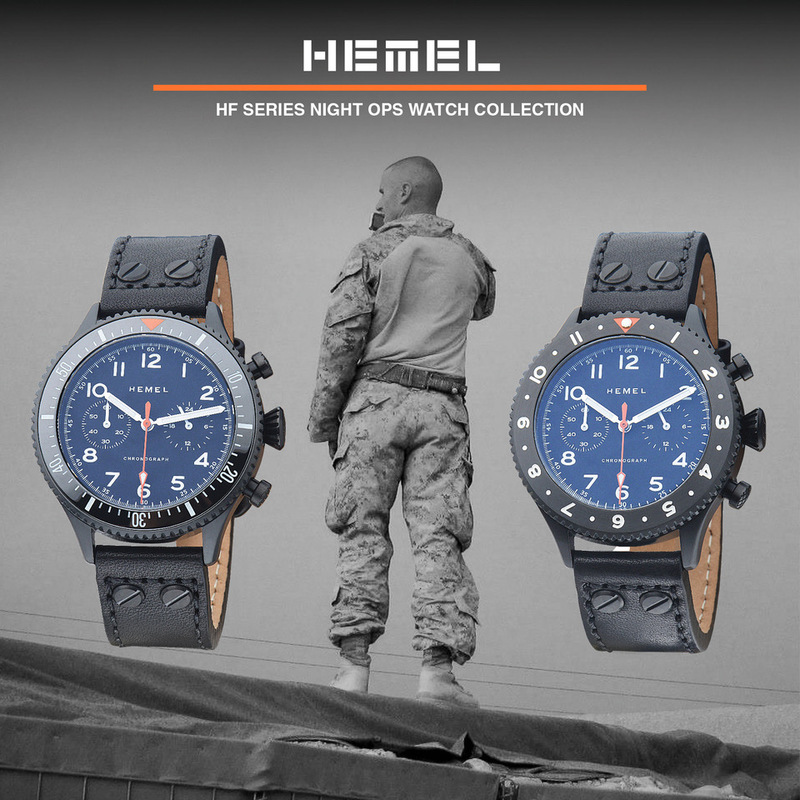 Both watches have 20mm straps that taper to signed, 18mm buckles. 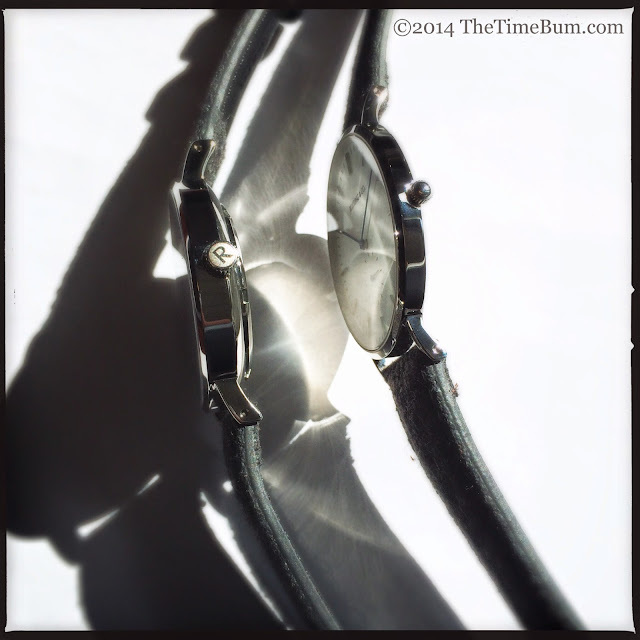 The sample watches came on standard quartz model's grey tweed straps with leather backing and keepers. The wooly texture of the straps looks fantastic in contrast to the smooth and sparse watch head. Color options include dark grey, light grey, black, and tan. The automatic will be supplied on brown suede and black leather straps. Tweed will be offered as an option. As much as I like the tweed strap, it is best suited for winter. In warmer weather, or for a dressier look, leather is in order. A nylon NATO creates a casual summer look. 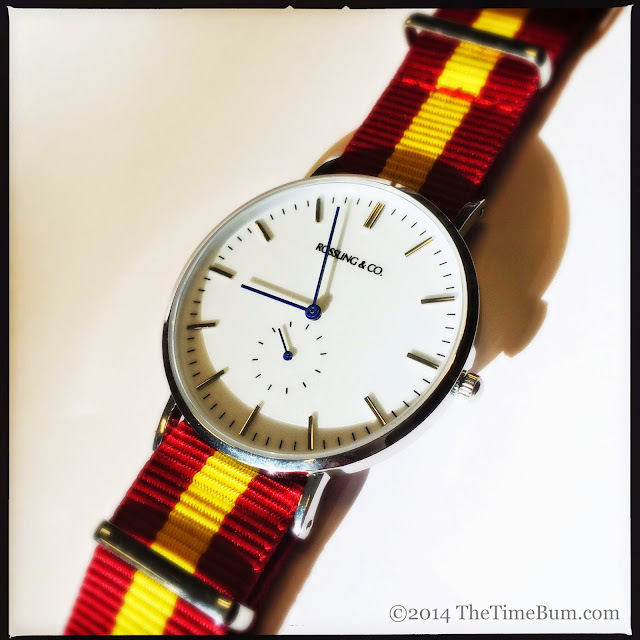 The simple lines on these watches will complement any number of strap options. 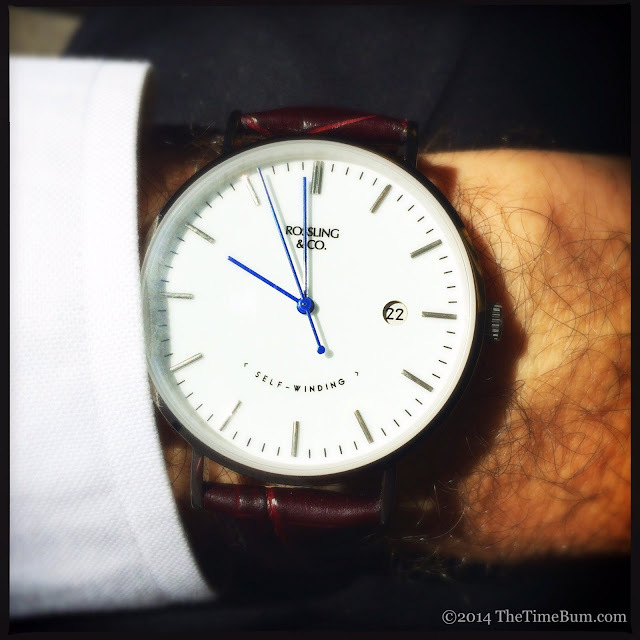 The Rosslings are attractive watches that could easily find their way into almost any collection. I would not wear one to go camping, but they are suitable for any civilized occasion. With simple strap changes they will go from weekend, to boardroom, to black tie. Their slim, mid-sized cases look as good on women as they do on men. The only question is which one: quartz or automatic? For some, only an automatic will do, and the choice is clear. If you are not wedded to a self-winder, then you might consider the lower price, thinner case, and cleaner dial of the quartz. On the other hand, the auto has a date window, better crown, and that silky smooth movement. It's a tough call, but lucky for you, Rossing & Co. has something for everyone. Pro: Low price, super slim, available in black. Sum: A versitile and elegant watch. 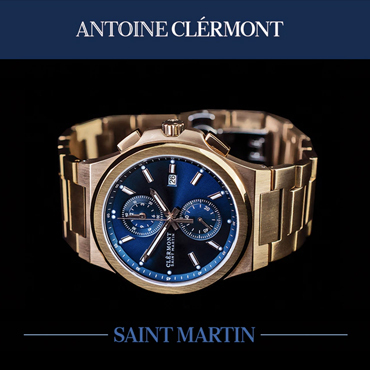 Pro: High-beat movement, better water resistance. Con: Rotor noise, thicker than the quartz. Sum: A versitile and elegant automatic watch. The Time Bum approves of both.